What is the State of Indiana Thinking with the Religious Freedom Restoration Act? 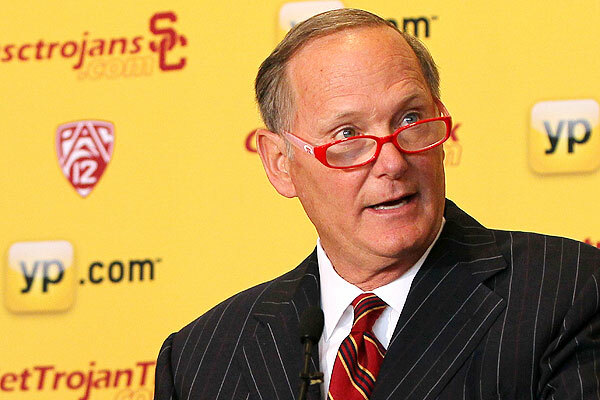 Former NFL quarterback and current USC athletic director Pat Haden plans to boycott the College Football Playoff committee meetings in Indiana this week because of the state’s newly passed religious freedom law. Indiana Governor Mike Pence signed the religious freedom law last week, and it takes effect July 1. The Religious Freedom Restoration Act would prohibit laws that “substantially burden” a person’s freedom of religion. Many critics of the law are afraid it would open the door for discrimination on the basis of sexual orientation. On Tuesday, Pence called for help to clarify that the law does not permit discrimination. Haden’s reason for boycotting is he has a gay son and posted this on his Twitter account. I commend Haden for supporting his son and putting him before his commitment as a member of the College Football Playoff selection committee. He showed his support for his son in the past when former Missouri defensive end Michael Sam ad veteran NBA vagabond Jason Collins came out as gay. “This issue is near and dear to my heart as I have a gay son,” “I am so proud of him and love him to death. At USC, we are all about inclusion. We have many gay athletes here, and we welcome and appreciate them. We promote diversity not just in terms of sexual orientation and ethnicity, but different points of view. In addition to Haden’s boycott UConn men’s basketball coach Kevin Ollie and his staff will not be attending the Final Four this year in Indianapolis a year after winning the NCAA title. Susan Herbst shared the news earlier today and it was shared by Matt Zampini who is the Sports Editor for the UConn campus newspaper. The state of Indiana should be ashamed for wanting this bill and Governor Pence should be embarrassed at how uninformed he was when he signed the bill if he is saying it was not his intent to put into law a bill that discriminates. I agree with former NBA star and current broadcaster Charles Barkley that the NCAA should pull this year’s Final Four from Indianapolis. The money that the state of Indiana would lose by pulling the Final Four in response to the Religious Freedom Restoration Act would send a powerful message that businesses do not have the right to deny services to anyone.